Build custom, high productivity business apps for your organisation with minimal coding. PowerApps gives you the building blocks you need to create new apps in days, not months. Automate and create apps from data sources like SharePoint, Dropbox, and Salesforce, and deploy instantly across mobile and desktop. Eliminate manual processes, forms and workflows, empowering your employees. 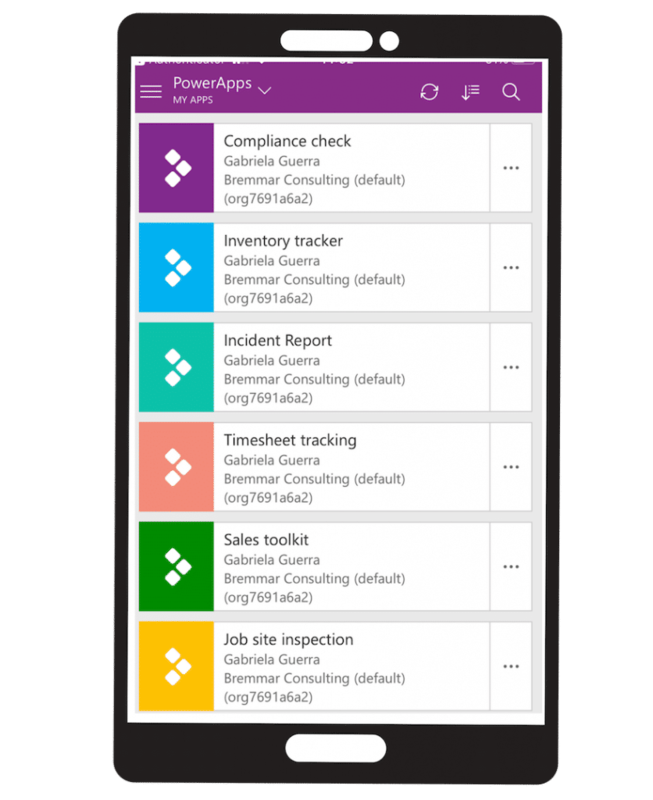 Power Users / Admins can start building PowerApps within a day, with the rest of the team able to learn within weeks. Provide a secure app environment for staff, ensuring data security and compliance with company and legal requirements. Use the Admin centre to see all your business apps, control users, permissions, and administer data policies. Unlock data from different places across your organisation and combine for maximum functionality. Customise SharePoint Online, use PowerApps with Microsoft Teams, and build apps on Dynamics 365. PowerApps puts fast, customised app development within reach of every business, all without the cost of hiring software developers. What type of apps do businesses build with PowerApps? Replace job site inspection forms with an on the go app which takes in user observations and generates a job site health overall score. Ensure OHS reporting is completed on the scene, by developing an incident reporting app that is submitted directly to the department for follow up. Make expensing easy with a timely and descriptive expense reporting and reimbursement app that includes taking photos of receipts. Allow employees to enter and edit leave requests, and managers to get quick insights – no matter where they are. Replace pdfs, forms and worksheets by developing a full employee onboarding app so new employees can get enrolled in systems fast and learn the ropes of their new workplace. Make sure your sales staff have intuitive access to opportunities, contacts, and sales calendars all in the one place while out in the field. We’re highly experienced in helping businesses in Perth, and around Australia, with Microsoft 365 solutions and can help you use PowerApps to address your needs! No project is too big or too small. Our work involves training and empowering your staff through the implementation process so they can take ownership of the new solution and continue to improve it. But don’t worry. We’ll stick around in the background in case you need support and will always be available to lead the future stages of the process if required. Combine PowerApps with Flow, for automating workflows across apps, and Power BI, to gain insights and predictions across your business data, to get the most out of your existing data, systems, and apps.